President Donald Trump gets into an exchange with Jim Acosta of CNN after giving remarks a day after the midterm elections on Nov. 7, 2018, in the East Room of the White House in Washington, DC. Republicans kept the Senate majority but lost control of the House to the Democrats. In what might be lowest point of this Badwater Basin administration, the White House straight up lied to the American public about a widely broadcast exchange between a CNN news correspondent and a White House intern and then shared doctored video to aid their lies. 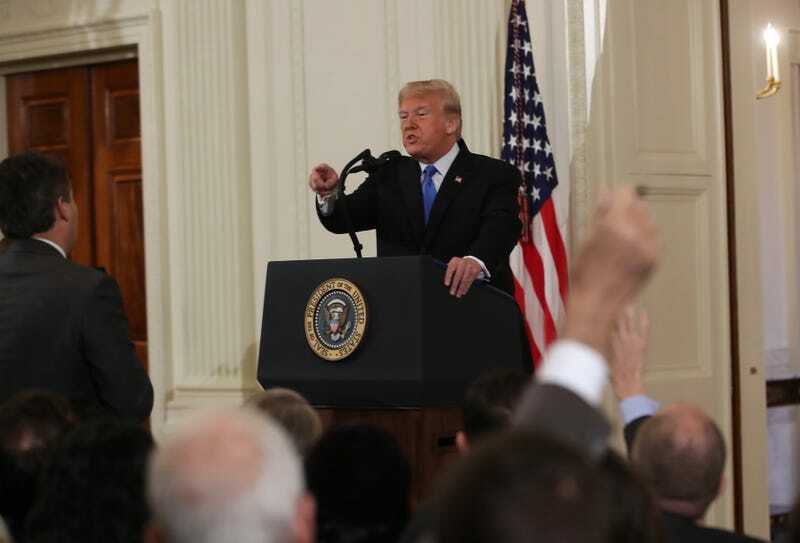 During a heated exchange between President Donald Trump and CNN reporter Jim Acosta Wednesday, the veteran reporter tried to ask another question as the president berated him, and a White House intern tasked with doing the president’s bidding attempted to take the microphone from Acosta. White House press secretary Sarah Huckabee Sanders, officially known as the Devil’s Mouthpiece, took to Twitter to further admonish Acosta—who at this point has violated the unspoken Trumpian rule that you can’t actually ask the president questions about his rhetoric or policy—and revoke his press pass. And then the Devil’s Mouthpiece shared a doctored video reportedly created by the reliable source and trusted news site InfoWars as her justification. As can clearly be seen here, the actual footage shows that Acosta’s arm comes down across the intern’s aggressive mic-snatching 1990s-rap-battle arm, but the footage shared on Huckabee Sanders’ account makes it look like Acosta has studied martial arts and is out here chopping bamas. Yup, you are actually in a nightmare that doesn’t seem to be ending anytime soon.